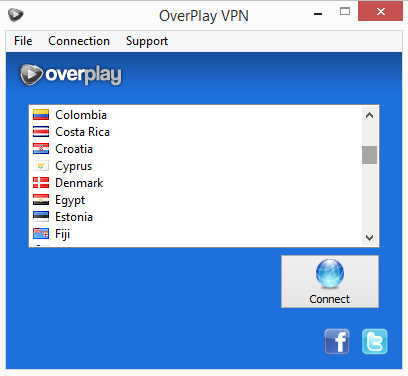 Overplay is a UK-based VPN/DNS provider that is still relatively new on the scene with a growing network of servers and it covers most bases when it comes to security protocols, offering PPTP, L2TP, and OpenVPN. As of this writing, the company has 48 servers around the world, which is quite a small amount when compared with many of the other VPN programs out there. The bulk of these servers are in Europe with a smaller selection in North America and Asia and a handful everywhere else. Nevertheless the VPN is priced at $9.99 a month, which is one of the more reasonable rates and the sign-up and registration process takes just a couple of minutes, requiring an email address. What Overplay may lack in server options, it makes up for in simplicity in design and ease of use. As you can see the user experience is kept very bare and easy to navigate. You have two options for browsing through the servers available, a basic mode and an advanced mode. On first launching the program, you’ll find a simple list of VPN servers. This is listed by country but doesn’t goes into too many specifics on the location of the server, at least not until you are connected. Users have an option for opening up an advanced mode for browsing through servers too. This provides a slightly more expanded list view that gives you details on the protocols available for certain servers, the specific city location, and the latency you should expect. To begin we tested the three United States servers that Overplay has, which are available in the East, West, and Central. 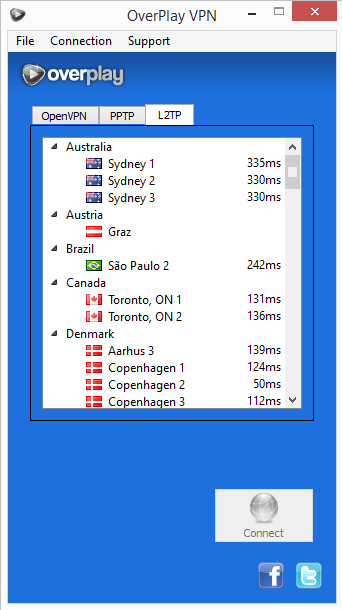 The first thing you will notice when connecting to an Overplay VPN server is how fast it connects, only a couple of seconds. There is very little time spent waiting around for the connection to complete. The US East server, which is based in Virginia, was tested first. We carried out a couple of speed tests on each server. This particular one gave us download speeds of 3.17Mbps and upload speeds of 2.68Mbps. The US Central server, in Chicago, was a little slower with speeds of 1.71Mbps (download) and 2.62Mbps (upload). The fastest of the US servers was the West coast server in California, according to an IP address check and not Seattle as listed by Overplay. This server had download speeds of 6.06Mbps, upload speeds of 2.45Mbps, making it the most ideal server in the US for most users, especially if you are looking to overcome geo-blocked content. Latency will vary. 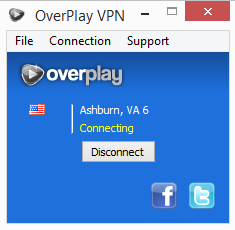 Most of Overplay’s servers are based in Europe though and all have pretty reasonable speeds. The London, UK server for example had download speeds of 5.62Mbps and upload speeds of 3.04Mbps. Overplay has a couple of customer support options but when we first tried to use the Request Help option, we were brought to an error page that then directed us to the general help page on the VPN’s website. Here you can run through dozens of FAQs or post a public question as well as email your query. However, it is not as convenient as an easy to use live chat feature that several other VPN providers to tend to offer. As for payments, Overplay accepts the obvious methods like credit card, debit card, and PayPal. At this time, it doesn’t appear to accept Bitcoin or other cryptocurrencies, which many VPNs usually do to appeal to the more security and privacy minded user. Overplay offers a five day refund period if you are unsatisfied with the service. These safeguards are likely put in place by the VPN provider to avoid any liability if a web user in one of these countries accessed government censored content. It reads more like a pre-emptive restriction than anything else. Users signing up from North Korea isn’t exactly likely but with a country like Cuba, which is loosening its grip of control on the internet, this policy may need to change in the future.